Engraver and stationer, 62 Preston Street, Brighton (later at Norfolk Square). Roles was born in 1847 at Downton in Wiltshire, the son of John and Anne Roles. His father kept an "eating house". In 1874 he married Matilda Emily Turtle in the Isle of Wight, and the couple then moved to Brighton, where they had three children: Thomas Roles (born in 1875), Sarah Elizabeth Roles (born in 1877) and Emily Matilda Roles (born in early 1881 or possibly late 1880). Sadly, Matilda died early in 1881, perhaps as a result of complications resulting from Emily's birth. The 1881 census records that the widowed Roles and his three children were living at 30 West Street and were being looked after by his unmarried elder sister, Charlotte Roles (born at Downton in about 1834). Roles must have been prospering as an engraver because he employed an assistant, two apprentices and an errand boy. A servant girl assisted Charlotte. On April 6, 1882, Roles remarried, at St John's Free Church at Southampton. The bride, Martha Hammond, had been born at Lymington in Hampshire in about 1851, and was the daughter of William Hammond, an excise officer. At this date Roles was living at 14 Duke Street in Brighton. Martha bore him at least five more children: Alice Lillian Roles (born in 1883), Lucy Marian Roles (born in 1885), Ernest Edward Roles (born in 1888), John Henry Roles (born in 1891) and Percy Alfred Roles (born in late 1892 or early 1893). By 1891 Roles had moved his home and engraving business to 62 Preston Street, where he remained for almost twenty years. Above the shop, which was on a street corner, there were two more main floors to accommodate his growing family and above that some attic rooms. In Pike's 1908 Brighton Directory Roles listed his "specialities" as "English and foreign postcards and rubber stamps". Roles published a limited number of good quality collotype cards printed in Saxony, which (with a few exceptions) had his name and address on the front in red below the pictures. Most commonly seen today are his cards of Stanmer, which he evidently supplied to a shop in the village. Subjects include the village street, a sheep fold in Stanmer Park and the old well with its donkey-powered winding gear. The captions are printed in red, and both undivided and divided backs have been found. Several 1903 and 1904 postmarks have been found. Roles also published collotypes of Newhaven of very similar design. One with an undivided back shows a mail boat steaming out of the harbour. A 1903 postmark has been seen. His most idiosyncratic collotype shows a "group of idols and other objects condemned as illegal and removed from the Church of the Annunciation, Brighton, September 1st 1903". The collection includes some very innocuous looking candlesticks as well as Madonnas and crucifixes! A halftone card of Knepp Castle before the fire of January 1904 may have been produced to special order. Its design is quite different from that of the collotype cards. The London firm of Frederick Hartmann printed some later versions of the Stanmer cards for Roles, whose name and address continued to appear on the front but with the Hartmann logo on the reverse. Roles solicited bulk orders for cards from private customers. 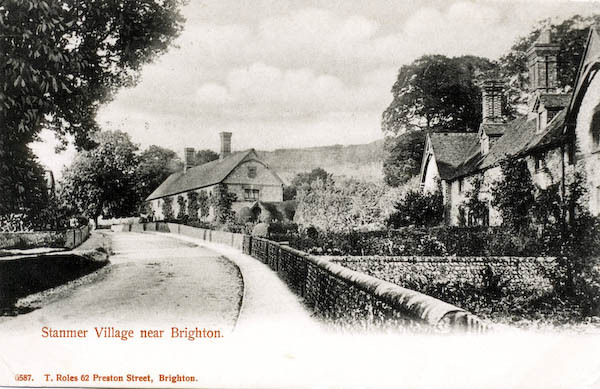 A collotype card has been found showing the lake in Queen's Park in Brighton that atypically has his name and Preston Street address on the left side of the picture (rather than underneath) and on the rear advertises a "large and choice selection" of "English, Scotch, Irish and Foreign" picture postcards "printed with Xmas greetings", which could be hand-painted from 1 shilling to 18 and a half shillings for an unspecified number, presumably a gross. At first glance, the Queen's Park card could be mistaken for a normal Roles creation, but the typography is subtley different and on the back of the card is a discreet label: "The Mezzotint Series". Evidently, Roles decided not to approach his normal German suppliers but have the card printed locally by Mezzotint. By 1911 Roles had moved to 47a Norfolk Square, where he worked as an engraver, die sinker, copperplate printer and stationer. Lucy assisted him with his business. There is no evidence that he was still publishing postcards at this date. The 1920 Electoral Register records that John Henry and Percy Alfred Roles were still living with their parents at Norfolk Square. Roles died on August 22, 1922, leaving effects of £1695. By this date he was living at 32 Robertson Road, Preston Park, Brighton. The Probate listing describes his son Thomas Roles as an electrical engineer, but no mention is made unfortunately of any of the other children.